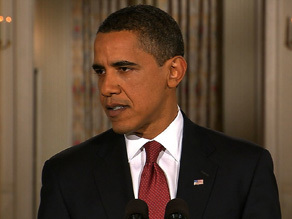 President Obama says creating 4 million jobs is the most important part of his economic plan. I took a trip to Elkhart, Indiana, today. Elkhart is a place that has lost jobs faster than anywhere else in America. In one year, the unemployment rate went from 4.7 percent to 15.3 percent. Companies that have sustained this community for years are shedding jobs at an alarming speed, and the people who've lost them have no idea what to do or who to turn to. They can't pay their bills. They've stopped spending money. And because they've stopped spending money, more businesses have been forced to lay off more workers. In fact, local TV stations have started running public service announcements to tell people where to find food banks, even as the food banks don't have enough to meet the demand. As we speak, similar scenes are playing out in cities and towns across America. Last Monday, more than 1,000 men and women stood in line for 35 firefighter jobs in Miami [Florida]. Last month, our economy lost 598,000 jobs, which is nearly the equivalent of losing every single job in the state of Maine. And if there's anyone out there who still doesn't believe this constitutes a full-blown crisis, I suggest speaking to one of the millions of Americans whose lives have been turned upside-down because they don't know where their next paycheck is coming from. Commentary: Obama's 100 days of problems? And that is why the single most important part of this economic recovery and reinvestment plan is the fact that it will save or create up to 4 million jobs, because that's what America needs most right now. It is absolutely true that we can't depend on government alone to create jobs or economic growth. That is and must be the role of the private sector. But at this particular moment, with the private sector so weakened by this recession, the federal government is the only entity left with the resources to jolt our economy back into life. It is only government that can break the vicious cycle, where lost jobs lead to people spending less money, which leads to even more layoffs. And breaking that cycle is exactly what the plan that's moving through Congress is designed to do. When passed, this plan will ensure that Americans who've lost their jobs through no fault of their own can receive greater unemployment benefits and continue their health care coverage. We'll also provide a $2,500 tax credit to folks who are struggling to pay the costs of their college tuition and $1,000 worth of badly needed tax relief to working- and middle-class families. These steps will put more money in the pockets of those Americans who are most likely to spend it, and that will help break the cycle and get our economy moving. But as we've learned very clearly and conclusively over the last eight years, tax cuts alone can't solve all of our economic problems, especially tax cuts that are targeted to the wealthiest few Americans. We have tried that strategy time and time again, and it's only helped lead us to the crisis we face right now. They'll be jobs creating the 21st-century classrooms, libraries, and labs for millions of children across America. And they'll be the jobs of firefighters and teachers and police officers that would otherwise be eliminated if we do not provide states with some relief. Now, after many weeks of debate and discussion, the plan that ultimately emerges from Congress must be big enough and bold enough to meet the size of the economic challenges that we face right now. It's a plan that is already supported by businesses representing almost every industry in America, by both the Chamber of Commerce and the AFL-CIO. It contains input, ideas and compromises from both Democrats and Republicans. It also contains an unprecedented level of transparency and accountability so that every American will be able to go online and see where and how we're spending every dime. What it does not contain, however, is a single pet project, not a single earmark, and it has been stripped of the projects members of both parties found most objectionable. Now, despite all of this, the plan's not perfect. No plan is. I can't tell you for sure that everything in this plan will work exactly as we hoped, but I can tell you with complete confidence that a failure to act will only deepen this crisis, as well as the pain felt by millions of Americans. Now, my administration inherited a deficit of over $1 trillion, but because we also inherited the most profound economic emergency since the Great Depression, doing little or nothing at all will result in even greater deficits, even greater job loss, even greater loss of income, and even greater loss of confidence. Those are deficits that could turn a crisis into a catastrophe, and I refuse to let that happen. As long as I hold this office, I will do whatever it takes to put this economy back on track and put this country back to work. I want to thank the members of Congress who've worked so hard to move this plan forward, but I also want to urge all members of Congress to act without delay in the coming week to resolve their differences and pass this plan. We find ourselves in a rare moment where the citizens of our country and all countries are watching and waiting for us to lead. It's a responsibility that this generation did not ask for, but one that we must accept for the future of our children and our grandchildren. The strongest democracies flourish from frequent and lively debate, but they endure when people of every background and belief find a way to set aside smaller differences in service of a greater purpose. That's the test facing the United States of America in this winter of our hardship, and it is our duty as leaders and citizens to stay true to that purpose in the weeks and months ahead. After a day of speaking with and listening to the fundamentally decent men and women who call this nation home, I have full faith and confidence that we can do it, but we're going to have to work together. That's what I intend to promote in the weeks and days ahead. And with that, I'll take some of your questions. And let me go to Jennifer Loven at [The Associated Press]. There you go. Question: Thank you, Mr. President. Earlier today in Indiana, you said something striking. You said that this nation could end up in a crisis without action that we would be unable to reverse. Can you talk about what you know or what you're hearing that would lead you to say that our recession might be permanent when others in our history have not? And do you think that you risk losing some credibility or even talking down the economy by using dire language like that? Obama: No, no, no, no. I think that what I've said is what other economists have said across the political spectrum, which is that, if you delay acting on an economy of this severity, then you potentially create a negative spiral that becomes much more difficult for us to get out of. We saw this happen in Japan in the 1990s, where they did not act boldly and swiftly enough and, as a consequence, they suffered what was called the lost decade, where essentially, for the entire '90s, they did not see any significant economic growth. So what I'm trying to underscore is what the people in Elkhart already understand, that this is not your ordinary, run-of-the-mill recession. We are going through the worst economic crisis since the Great Depression. We've lost now 3.6 million jobs, but what's perhaps even more disturbing is that almost half of that job loss has taken place over the last three months, which means that the problems are accelerating instead of getting better. Step number one: We have to pass an economic recovery and reinvestment plan. And we've made progress. There was a vote this evening that moved the process forward in the Senate. We already have a House bill that's passed. I'm hoping, over the next several days, that the House and the Senate can reconcile their differences and get that bill on my desk. There have been criticisms from a bunch of different directions about this bill, so let me just address a few of them. Some of the criticisms really are with the basic idea that government should intervene at all in this moment of crisis. Now, you have some people, very sincere, who philosophically just think the government has no business interfering in the marketplace. And, in fact, there are several who've suggested that FDR [President Roosevelt] was wrong to interfere back in the New Deal. They're fighting battles that I thought were resolved a pretty long time ago. Most economists almost unanimously recognize that, even if philosophically you're -- you're wary of government intervening in the economy, when you have the kind of problem we have right now -- what started on Wall Street, goes to Main Street, suddenly businesses can't get credit, they start paring back their investment, they start laying off workers, workers start pulling back in terms of spending -- that, when you have that situation, that government is an important element of introducing some additional demand into the economy. We stand to lose about $1 trillion worth of demand this year and another trillion next year. And what that means is you've got this gaping hole in the economy. That's why the figure that we initially came up with of approximately $800 billion was put forward. That wasn't just some random number that I plucked out of -- out of a hat. That was Republican and Democratic, conservative and liberal economists that I spoke to who indicated that, given the magnitude of the crisis and the fact that it's happening worldwide, it's important for us to have a bill of sufficient size and scope that we can save or create 4 million jobs. That still means that you're going to have some net job loss, but at least we can start slowing the trend and moving it in the right direction. Now, the recovery and reinvestment package is not the only thing we have to do. It's one leg of the stool. We are still going to have to make sure that we are attracting private capital, get the credit markets flowing again, because that's the lifeblood of the economy. And that means having some transparency and oversight in the system. It means that we correct some of the mistakes with TARP [Troubled Asset Relief Program] that were made earlier, the lack of consistency, the lack of clarity, in terms of how the program was going to move forward. It means that we condition taxpayer dollars that are being provided to banks on them showing some restraint when it comes to executive compensation, not using the money to charter corporate jets when they're not necessary. It means that we focus on housing and how are we going to help homeowners that are suffering foreclosure or homeowners who are still making their mortgage payments, but are seeing their property values decline. So there are going to be a whole range of approaches that we have to take for dealing with the economy. My bottom line is to make sure that we are saving or creating 4 million jobs, we are making sure that the financial system is working again, that homeowners are getting some relief. And I'm happy to get good ideas from across the political spectrum, from Democrats and Republicans. What I won't do is return to the failed theories of the last eight years that got us into this fix in the first place, because those theories have been tested, and they have failed. And that's what part of the election in November was all about. OK. Karen Boeing (ph) of Reuters? Question: Thank you, Mr. President. I'd like to shift gears to foreign policy. What is your strategy for engaging Iran? And when will you start to implement it? Will your timetable be affected at all by the Iranian elections? And are you getting any indications that Iran is interested in a dialogue with the United States? Obama: I said during the campaign that Iran is a country that has extraordinary people, extraordinary history and traditions, but that its actions over many years now have been unhelpful when it comes to promoting peace and prosperity both in the region and around the world, that their attacks -- or their -- their financing of terrorist organizations like Hezbollah and Hamas, the bellicose language that they've used towards Israel, their development of a nuclear weapon or their pursuit of a nuclear weapon, that all those things create the possibility of destabilizing the region and are not only contrary to our interests, but I think are contrary to the interests of international peace. What I've also said is that we should take an approach with Iran that employs all of the resources at the United States' disposal, and that includes diplomacy. And so my national security team is currently reviewing our existing Iran policy, looking at areas where we can have constructive dialogue, where we can directly engage with them. And my expectation is, in the coming months, we will be looking for openings that can be created where we can start sitting across the table, face-to-face diplomatic overtures, that will allow us to move our policy in a new direction. There's been a lot of mistrust built up over the years, so it's not going to happen overnight. And it's important that, even as we engage in this direct diplomacy, we are very clear about certain deep concerns that we have as a country, that Iran understands that we find the funding of terrorist organizations unacceptable, that we're clear about the fact that a nuclear Iran could set off a nuclear arms race in the region that would be profoundly destabilizing. So there are going to be a set of objectives that we have in these conversations, but I think that there's the possibility at least of a relationship of mutual respect and progress. And I think that, if you look at how we've approached the Middle East, my designation of George Mitchell as a special envoy to help deal with the Arab-Israeli situation, some of the interviews that I've given, it indicates the degree to which we want to do things differently in the region. Now it's time for Iran to send some signals that it wants to act differently, as well, and recognize that, even as it has some rights as a member of the international community, with those rights come responsibilities. Question: Thank you, Mr. President. You have often said that bipartisanship is extraordinarily important, overall and in this stimulus package, but now, when we ask your advisers about the lack of bipartisanship so far -- zero votes in the House, three in the Senate -- they say, "Well, it's not the number of votes that matters; it's the number of jobs that will be created." Is that a sign that you are moving away -- your White House is moving away from this emphasis on bipartisanship? And what went wrong? Did you underestimate how hard it would be to change the way Washington works? Obama: Well, I don't think -- I don't think I underestimated it. I don't think the -- the American people underestimated it. They understand that there have been a lot of bad habits built up here in Washington, and it's going to take time to break down some of those bad habits. You know, when I made a series of overtures to the Republicans, going over to meet with both Republican caucuses, you know, putting three Republicans in my cabinet -- something that is unprecedented -- making sure that they were invited here to the White House to talk about the economic recovery plan, all those were not designed simply to get some short-term votes. They were designed to try to build up some trust over time. And I think that, as I continue to make these overtures, over time, hopefully that will be reciprocated. But understand the bottom line that I've got right now, which is what's happening to the people of Elkhart and what's happening across the country. I can't afford to see Congress play the usual political games. What we have to do right now is deliver for the American people. So my bottom line when it comes to the recovery package is: Send me a bill that creates or saves 4 million jobs. Because everybody has to be possessed with a sense of urgency about putting people back to work, making sure that folks are staying in their homes, that they can send their kids to college. That doesn't negate the continuing efforts that I'm going to make to listen and engage with my Republican colleagues. And hopefully the tone that I've taken, which has been consistently civil and respectful, will pay some dividends over the long term. There are going to be areas where we disagree, and there are going to be areas where we agree. Now, if that's their opening position or their closing position in negotiations, then we're probably not going to make much progress, because I don't think that's economically sound and I don't think what -- that's what the American people expect, is for us to stand by and do nothing. There are others who recognize that we've got to do a significant recovery package, but they're concerned about the mix of what's in there. And if they're sincere about it, then I'm happy to have conversations about this tax cut versus that -- that tax cut or this infrastructure project versus that infrastructure project. But what I've -- what I've been concerned about is some of the language that's been used suggesting that this is full of pork and this is wasteful government spending, so on and so forth. Number two is that, although there are some programs in there that I think are good policy, some of them aren't job-creators. I think it's perfectly legitimate to say that those programs should be out of this particular recovery package and we can deal with them later. But when they start characterizing this as pork, without acknowledging that there are no earmarks in this package -- something, again, that was pretty rare over the last eight years -- then you get a feeling that maybe we're playing politics instead of actually trying to solve problems for the American people. So I'm going to keep on engaging. I hope that, as we get the Senate and the House bills together, that everybody is willing to give a little bit. I suspect that the package that emerges is not going to be 100 percent of what I want. But my bottom line is, are we creating 4 million jobs? And are we laying the foundation for long-term economic growth? This is another concern that I've had in some of the arguments that I'm hearing. When people suggest that, "What a waste of money to make federal buildings more energy-efficient." Why would that be a waste of money? We're creating jobs immediately by retrofitting these buildings or weatherizing 2 million Americans' homes, as was called for in the package, so that right there creates economic stimulus. And we are saving taxpayers when it comes to federal buildings potentially $2 billion. In the case of homeowners, they will see more money in their pockets. And we're reducing our dependence on foreign oil in the Middle East. Why wouldn't we want to make that kind of investment? Now, maybe philosophically you just don't think that the federal government should be involved in energy policy. I happen to disagree with that; I think that's the reason why we find ourselves importing more foreign oil now than we did back in the early '70s when OPEC first formed. And we can have a respectful debate about whether or not we should be involved in energy policymaking, but don't suggest that somehow that's wasteful spending. That's exactly what this country needs. The same applies when it comes to information technologies in health care. We know that health care is crippling businesses and making us less competitive, as well as breaking the banks of families all across America. And part of the reason is, we've got the most inefficient health care system imaginable. We're still using paper. We're still filing things in triplicate. Nurses can't read the prescriptions that doctors -- that doctors have written out. Why wouldn't we want to put that on -- put that on an electronic medical record that will reduce error rates, reduce our long-term costs of health care, and create jobs right now? Education, yet another example. The suggestion is, why should the federal government be involved in school construction? Well, I visited a school down in South Carolina that was built in the 1850s. Kids are still learning in that school, as best they can, when the -- when the railroad -- when the -- it's right next to a railroad. And when the train runs by, the whole building shakes and the teacher has to stop teaching for a while. The -- the auditorium is completely broken down; they can't use it. So why wouldn't we want to build state-of-the-art schools with science labs that are teaching our kids the skills they need for the 21st century, that will enhance our economy, and, by the way, right now, will create jobs? All right, Chuck Todd. Where's Chuck? Question: Thank you, Mr. President. In your opening remarks, you talked about that, if your plan works the way you want it to work, it's going to increase consumer spending. But isn't consumer spending, or overspending, how we got into this mess? And if people get money back into their pockets, do you not want them saving it or paying down debt first before they start spending money into the economy? Obama: Well, first of all, I don't think it's accurate to say that consumer spending got us into this mess. What got us into this mess initially were banks taking exorbitant, wild risks with other people's monies based on shaky assets and because of the enormous leverage, where they had $1 worth of assets and they were betting $30 on that $1, what we had was a crisis in the financial system. That led to a contraction of credit, which, in turn, meant businesses couldn't make payroll or make inventories, which meant that everybody became uncertain about the future of the economy, so people started making decisions accordingly, reducing investment, initiating layoffs, which, in turn, made things worse. Now, you are making a legitimate point, Chuck, about the fact that our savings rate has declined and this economy has been driven by consumer spending for a very long time. And that's not going to be sustainable. You know, if -- if all we're doing is spending and we're not making things, then over time other countries are going to get tired of lending us money and eventually the party's going to be over. Well, in fact, the party now is over. And so the -- the sequence of how we're approaching this is as follows. Our immediate job is to stop the downward spiral, and that means putting money into consumers' pockets. It means loosening up credit. It means putting forward investments that not only employ people immediately, but also lay the groundwork for long-term economic growth. And -- and that, by the way, is important, even if you're a fiscal conservative, because the biggest problem we're going to have with our federal budget is if we continue a situation in which there are no tax revenues because economic growth is plummeting at the same time as we've got more demands for unemployment insurance, we've got more demands for people who have lost their health care, more demand for food stamps. That will put enormous strains on the federal budget, as well as the state budget. So the most important thing we can do for our budget crisis right now is to make sure that the economy doesn't continue to tank. And that's why passing the economic recovery plan is the right thing to do, even though I recognize that it's expensive. Look, I -- I would love not to have to spend money right now. I'd love -- you know, this notion that somehow I came in here just ginned up to spend $800 billion, you know, I mean, that wasn't -- that wasn't -- that wasn't how I envisioned my presidency beginning. But we have to adapt to existing circumstances. Now, what we are going to also have to do is to make sure that, as soon as the economy stabilizes, investment begins again, we're no longer contracting but we're growing, that our mid-term and long-term budget is dealt with, and I think the same is true for individual consumers. Right now, they're -- they're just trying to figure out, how do I make sure that, if I lose my job, you know, I'm still going to be able to make my mortgage payments? Or they're worried about, how am I going to pay next month's bills? So they're not engaging in a lot of long-term financial planning. Once the economy stabilizes and people are less fearful, then I do think that we're going to have to start thinking about, how do we operate more prudently? Because there's no such thing as a free lunch. So if -- if you want to get -- if you want to buy a house, then putting zero down and buying a house that is probably not affordable for you in case something goes wrong, that's something that has to be reconsidered. So we're going to have to change our -- our bad habits. But right now, the key is making sure that we pull ourselves out of the economic slump that we're in. All right, Julianna Goldman, Bloomberg? Question: Thank you, Mr. President. Many experts, from Nouriel Roubini to Sen. [Chuck] Schumer [D-New York], have said that it will cost the government more than $1 trillion to really fix the financial system. During the campaign, you promised the American people that you won't just tell them what they want to hear, but what they need to hear. My immediate task is making sure that the second half of that money, $350 billion, is spent properly. That's my first job. Before I even think about what else I've got to do, my first task is to make sure that my secretary of the treasury, Tim Geithner, working with Larry Summers, my national economic adviser, and others are coming up with the best possible plan to use this money wisely in a way that's transparent, in a way that provides clear oversight, that we are conditioning any money that we give to banks on them reducing executive compensation to reasonable levels and to make sure that they're not wasting that money. We are going to have to work with the banks in an effective way to clean up their balance sheets so that some trust is restored within the marketplace, because right now part of the problem is that nobody really knows what's on the bank's books. Any given bank, they're not sure what kinds of losses are there. We've got to open things up and restore some trust. We also have to deal with the housing issue in a clear and consistent way. I don't want to pre-empt my secretary of the treasury. He's going to be laying out these principles in great detail tomorrow. But my instruction to him has been: Let's get this right. Let's create a template in which we're restoring market confidence. And the reason that's so important is because we don't know yet whether we're going to need additional money or how much additional money we'll need until we've seen how successful we are at restoring a sense of confidence in the marketplace that the federal government and the Federal Reserve Bank and the FDIC, working in concert, know what they're doing. That can make a big difference in terms of whether or not we attract private capital back into the marketplace. And ultimately the government cannot substitute for all the private capital that has been withdrawn from the system. We've got to restore confidence so that private capital goes back in. Question: Thank you, Mr. President. My question follows Julianna's in -- in content. The American people have seen hundreds of billions of dollars spent already, and still the economy continues to freefall. Question: ... how can the American people gauge whether or not your programs are working? Can they -- should they be looking at the metric of the stock market, home foreclosures, unemployment? What metric should they use when and how will they know if it's working or whether or not we need to go to a Plan B? Obama: I think my initial measure of success is creating or saving 4 million jobs. That's bottom line number one, because, if people are working, then they've got enough confidence to make purchases, to make investments. Businesses start seeing that consumers are out there with a little more confidence, and they start making investments, which means they start hiring workers. So step number one: job creation. Step number two: Are we seeing the credit markets operate effectively? You know, I can't tell you how many businesses that I talk to that are successful businesses but just can't get credit. Part of the problem in Elkhart that I heard about today was the fact that -- this is the R.V. [recreational vehicle] capital of America. You've got a bunch of R.V. companies that have customers who want to purchase R.V.s, but even though their credit is good, they can't get the loan. Now, the businesses also can't get loans to make payments to their suppliers. But when they have consumers, consumers can't get the loans that they need. So normalizing the credit markets is, I think, step number two. Step number three is going to be housing. Have we stabilized the housing market? Now, you know, the federal government doesn't have complete control over that, but if our plan is effective, working with the Federal Reserve Bank, working with the FDIC, I think what we can do is stem the rate of foreclosure and we can start stabilizing housing values over time. And the most -- the -- the biggest measure of success is whether we stop contracting and shedding jobs and we start growing again. Now, you know, I don't have a crystal ball. And as I said, this is an unprecedented crisis. But my hope is that after a difficult year -- and this year is going to be a difficult year -- that businesses start investing again, they start making decisions that, you know, in fact, there's money to be made out there, customers or consumers start feeling that their jobs are stable and safe, and they start making purchases again, and, if we get things right, then, starting next year, we can start seeing significant improvement. Ed Henry. Where's Ed? CNN, there he is. Question: Thank you, Mr. President. You've promised to send more troops to Afghanistan. And since you've been very clear about a timetable to withdraw combat troops from Iraq within 16 months, I wonder, what's your timetable to withdraw troops eventually from Afghanistan? And related to that, there's a Pentagon policy that bans media coverage of the flag-draped coffins from coming in to Dover Air Force Base. And back in 2004, then-Sen. Joe Biden said that it was shameful for dead soldiers to be, quote, "snuck back into the country under the cover of night." You've promised unprecedented transparency, openness in your government. Will you overturn that policy so the American people can see the full human cost of war? Obama: Your question is timely. We got reports that four American service members have been killed in Iraq today. And, you know, obviously, our thoughts and prayers go out to the families. I've said before that -- you know, people have asked me, when did it hit you that you are now president? And what I told them was the most sobering moment is signing letters to the families of our fallen heroes. It reminds you of the responsibilities that you carry in this office and -- and the consequences of the decisions that you make. With respect to Afghanistan, this is going to be a big challenge. I think, because of the extraordinary work done by our troops and some very good diplomatic work done by Ambassador [Ryan] Crocker in Iraq, we just saw an election in Iraq that went relatively peacefully and you get a sense that the political system is now functioning in a meaningful way. In addition, you've got the Taliban and al Qaeda operating in the FATA [Federally Administered Tribal Areas] and these border regions between Afghanistan and Pakistan. And what we haven't seen is the kind of concerted effort to root out those safe havens that would ultimately make our mission successful. So we are undergoing a thorough going review. Not only is Gen. [David] Petraeus -- now the head of CENTCOM -- conducting his own review; he's now working in concert with the special envoy that I've sent over, Richard Holbrooke, one of our top diplomats, to evaluate a regional approach. We are going to need more effective coordination of our military efforts, with diplomatic efforts, with development efforts, with more effective coordination with our allies in order for us to be successful. The bottom line though -- and I just want to remember the American people, because this is going to be difficult -- is this is a situation in which a region served as the base to launch an attack that killed 3,000 Americans. And this past week, I met with families of those who were lost in 9/11, a reminder of the costs of allowing those safe havens to exist. My bottom line is that we cannot allow al Qaeda to operate. We cannot have those safe havens in that region. And we're going to have to work both smartly and effectively, but with consistency in order to make sure that those safe havens don't exist. I do not have yet a timetable for how long that's going to take. What I know is I'm not going to make -- I'm not going to allow al Qaeda or [Osama] bin Laden to operate with impunity, planning attacks on the U.S. homeland. Question: Thank you, sir. I wanted to ask you, on the next bank bailout, are you going to impose a requirement that the financial institutions use this money to loosen up credit and make new lending? And if not, how do you make the case to the American people that this bailout will work when the last one didn't? Obama: Again, Helene -- and I'm trying to avoid pre-empting my secretary of the treasury. I want all of you to show up at his press conference, as well. He's going to be terrific. But this relates to Jake's earlier question. One of my bottom lines is whether or not credit is flowing to the people who need it. Is it flowing to banks -- excuse me. Is it flowing to businesses, large and small? Is it flowing to consumers? Are they able to operate in ways that translate into jobs and economic growth on Main Street? And the package that we've put together is designed to help do that. And beyond that, I'm going to make sure that Tim gets his moment in the sun tomorrow. All right. Major Garrett, where's Major? Question: Mr. President, at a speech Friday that many of us covered, Vice President Biden said the following thing about a conversation the two of you had in the Oval Office about a subject he didn't disclose. "If we do everything right, if we do it with absolute certainty, if we stand up there and we really make the tough decisions, there's still a 30 percent chance we're going to get it wrong." Since the vice president brought it up, can you tell the American people, sir, what you were talking about? And if not, can you at least reassure them it wasn't the stimulus bill or the bank rescue plan and if, in general, you agree with that ratio of success, 30 percent failure, 70 percent success? ... not surprisingly. But let me try this out. I think what Joe may have been suggesting -- although I wouldn't put numerical -- I wouldn't ascribe any numerical percentage to any of this -- is that, given the magnitude of the challenges that we have, any single thing that we do is going to be part of the solution, not all of the solution. And as I said in my introductory remarks, not everything we do is going to work out exactly as we intended it to work out. You know, this is an unprecedented problem. And, you know, when you talk to economists, there's some general sense of how we're going to move forward. There's some strong consensus about the need for a recovery package of a certain magnitude. There's a strong consensus that you shouldn't put all your eggs in one basket, all tax cuts or all investment, but that there should be a range of approaches. But even if we do everything right on that, we've still got to deal with what we just talked about, the financial system, and making sure that banks are lending again. We're still going to have to deal with housing. We're still going to have to make sure that we've got a regulatory structure, a regulatory architecture for the financial system that prevents crises like this from occurring again. Now, those are big, complicated tasks. So I don't know whether Joe was referring to that, but I used that as a launching point to make a general point about these issues. Obama: I have no idea. I really don't. Michael Fletcher from the Washington Post? Question: Yes, thank you, sir. What is your reaction to Alex Rodriguez's admission that he used steroids as a member of the Texas Rangers? Obama: You know, I think it's depressing news on top of what's been a flurry of depressing items when it comes to Major League Baseball. And if you're a fan of Major League Baseball, I think it -- it tarnishes an entire era, to some degree. And it's unfortunate, because I think there are a lot of ballplayers who played it straight. And, you know, the thing I'm probably most concerned about is the message it sends to our kids. What I'm pleased about is Major League Baseball seems to finally be taking this seriously, to recognize how big a problem this is for the sport, and that our kids hopefully are watching and saying, "You know what? There are no shortcuts, that when you try to take shortcuts, you may end up tarnishing your entire career, and that your integrity's not worth it." That's the message I hope is communicated. All right. Helen? This is my inaugural moment here. Question: Mr. President, do you think that Pakistan and -- are maintaining the safe havens in Afghanistan for these so-called terrorists? And, also, do you know of any country in the Middle East that has nuclear weapons? Obama: Well, I think that Pakistan -- there is no doubt that, in the FATA region of Pakistan, in the mountainous regions along the border of Afghanistan, that there are safe havens where terrorists are operating. And one of the goals of Ambassador Holbrooke, as he is traveling throughout the region, is to deliver a message to Pakistan that they are endangered as much as we are by the continuation of those operations and that we've got to work in a regional fashion to root out those safe havens. It's not acceptable for Pakistan or for us to have folks who, with impunity, will kill innocent men, women and children. And, you know, I -- I believe that the new government of Pakistan and -- and Mr. [President Asif Ali] Zardari cares deeply about getting control of the situation. We want to be effective partners with them on that issue. Obama: Well, Mr. Holbrooke is there, and that's exactly why he's being sent there, because I think that we have to make sure that Pakistan is a stalwart ally with us in battling this terrorist threat. With respect to nuclear weapons, you know, I don't want to speculate. What I know is this: that if we see a nuclear arms race in a region as volatile as the Middle East, everybody will be in danger. And one of my goals is to prevent nuclear proliferation generally. I think that it's important for the United States, in concert with Russia, to lead the way on this. Obama: ... so that we then have the standing to go to other countries and start stitching back together the nonproliferation treaties that, frankly, have been weakened over the last several years. OK.
Sam Stein, Huffington Post. Where's Sam? Here. Go ahead. Question: Thank you, Mr. President. Today, Sen. Patrick Leahy [D-Vermont] announced that he wants to set up a truth and reconciliation committee to investigate the misdeeds of the Bush administration. He said that, before you turn the page, you have to read the page first. So I will take a look at Sen. Leahy's proposal, but my general orientation is to say let's get it right moving forward. Question: Thank you, Mr. President. If it's this hard to get more than a handful of Republican votes on what is relatively easy -- spending tons of money and cutting people's taxes -- when you look down the road at health care, and entitlement reform, and energy reform, those are really tough choices. You're going to be asking some people to get less and some people to pay more. Obama: Well, as I said before, Mara, I think that old habits are hard to break. And we're coming off an election, and I think people want to sort of test the limits of -- of what they can get. You know, there's a lot of jockeying in this town, and a lot of "who's up and who's down," and positioning for the next election. And what I've tried to suggest is that this is one of those times where we've got to put that kind of behavior aside, because the American people can't afford it. The people in Elkhart can't afford it. The single mom who's trying to figure out how to keep her house can't afford it. And whether we're Democrats or Republicans, surely there's got to be some capacity for us to work together, not agree on everything, but at least set aside small differences to get things done. Now, just in terms of the historic record here, the Republicans were brought in early and were consulted. And you'll remember that, when we initially introduced our framework, they were pleasantly surprised and complimentary about the tax cuts that were presented in that framework. Those tax cuts are still in there. I mean, I suppose what I could have done is started off with no tax cuts, knowing that I was going to want some, and then let them take credit for all of them, and maybe that's the lesson I learned. But there was consultation; there will continue to be consultation. One thing that I think is important is to recognize that, because all these -- all these items that you listed are hard, that people have to break out of some of the ideological rigidity and gridlock that we've been carrying around for too long. And let me give you a prime example. When it comes to how we approach the issue of fiscal responsibility, again, it's a little hard for me to take criticism from folks about this recovery package after they've presided over a doubling of the national debt. I'm not sure they have a lot of credibility when it comes to fiscal responsibility. Having said that, I think there are a lot of Republicans who are sincere in recognizing that, unless we deal with entitlements in a serious way, the problems we have with this year's deficit and next year's deficit pale in comparison to what we're going to be seeing 10 or 15 years or 20 years down the road. Both Democrats and Republicans are going to have to think differently in order to come together and solve that problem. I think there are areas like education where some in my party have been too resistant to reform and have argued only money makes a difference. And there have been others on the Republican side or the conservative side who said, "No matter how much money you spend, nothing makes a difference, so let's just blow up the public school systems." So my whole goal over the next four years is to make sure that, whatever arguments are persuasive and backed up by evidence and facts and proof that they can work, that we are pulling people together around that kind of pragmatic agenda. And I think that there was an opportunity to do this with this recovery package, because, as I said, although there are some politicians who are arguing that we don't need a stimulus, there are very few economists who are making that argument. I mean, you've got economists who were advising [Sen.] John McCain [2008 Republican presidential candidate], economists who were advisers to George Bush, one and two, all suggesting that we actually needed a serious recovery package. And so when I hear people just saying, "Ah, we don't need to do anything," "This is a spending bill, not a stimulus bill," without acknowledging that, by definition, part of any stimulus package would include spending -- that's the point -- then what I get a sense of is, is that there's some ideological blockage there that needs to be cleared up. But I am the eternal optimist. I think that, over time, people respond to civility and -- and rational argument. I think that's what the people of Elkhart and the people around America are looking for. And that's what I'm -- that's the kind of leadership I'm going to try to provide.